While April heralds the arrival of spring, May is…awkward. Not quite summer, it teases us with unexpected spells of sunshine before reverting to a soggy, chilly mess. Despite the unpredictable weather patterns, May brings plenty of causes for celebration: two bank holiday weekends and- this year- the Queen’s 90th Birthday. What better way to march into the summer months than fuelled by cucumber finger sandwiches and Victoria sponges? The Bright Paper Packages team agrees and their Mary 2016 box centres on an afternoon tea party. Eschewing the muted palette of colder months, this box promises sharp floral designs, zingy flavours and tea-inspired luxuries. 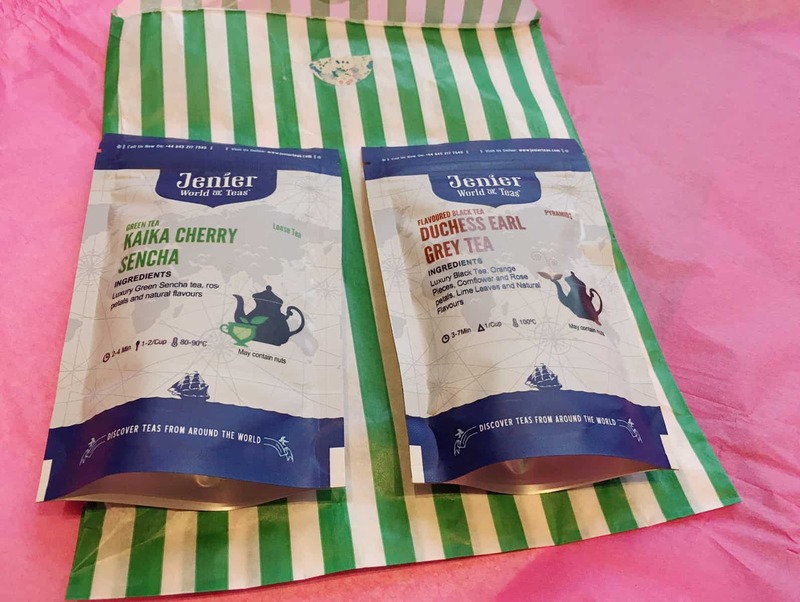 Cognisant of the winning formula to deliver subscribers a trove of surprises and treats, Bright Paper Packages also engages with its customers. They encourage feedback and the small, hand-turned details give each box a bespoke quality, as if it were a gift curated for you personally. 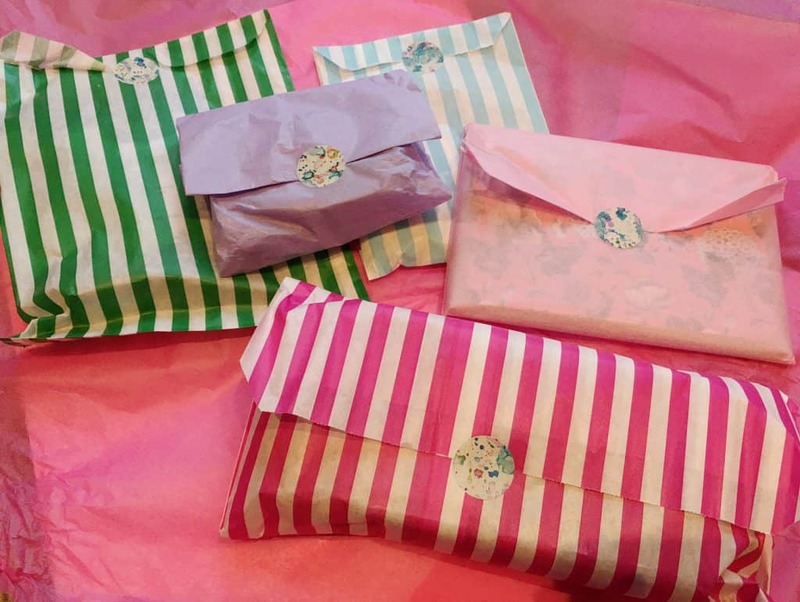 Every item is hand wrapped or bagged with care, lovingly coddled with tissue paper and nestled into soft paper bedding. Within the confines of a cardboard box, all items are protected from their journey. With my initial peek inside, I noticed that the subscriber letter had been replaced with an information card- with a charming garden illustration on the reverse that hinted towards the theme of the items contained within. Vintage florals are synonymous with a tea party and Fox & Lark’s designs are ideal for instant flair. 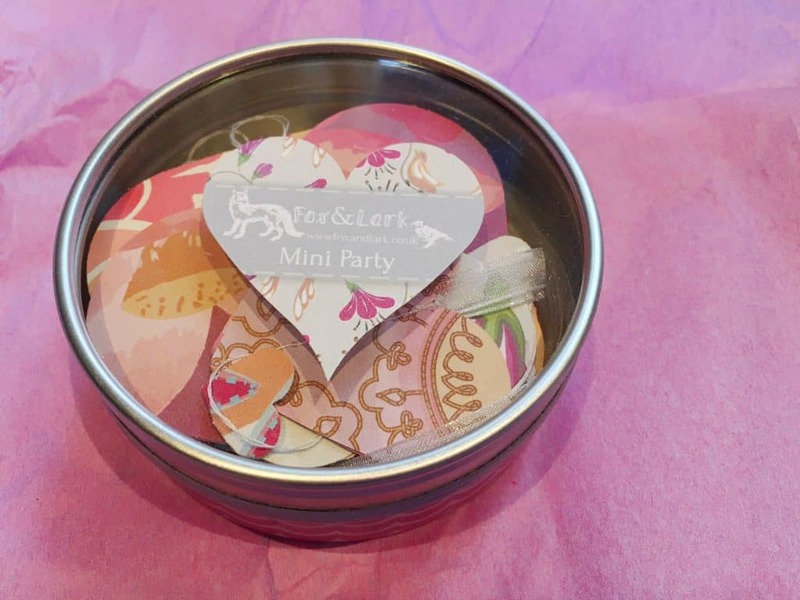 In this mini ‘party in a tin’, tiny fixings for a successful event are included, from heart-shaped bunting to patterned heart confetti. I like the idea of having a coherent motif of decorations on hand for a quick, last minute dressing of tables before guests arrive. The tin’s contents were designed by Liona Baldwin and each is cut from handsome patterns of pastels, flora and small creatures- all reminiscent of the English countryside. These charming touches are appropriate for any summer occasion and are printed in card, so you can rescue them at the end of the afternoon to be reused. No tea party would be complete without biscuits and Blue Moose Kitchen has supplied a slightly unconventional twist on shortbread. 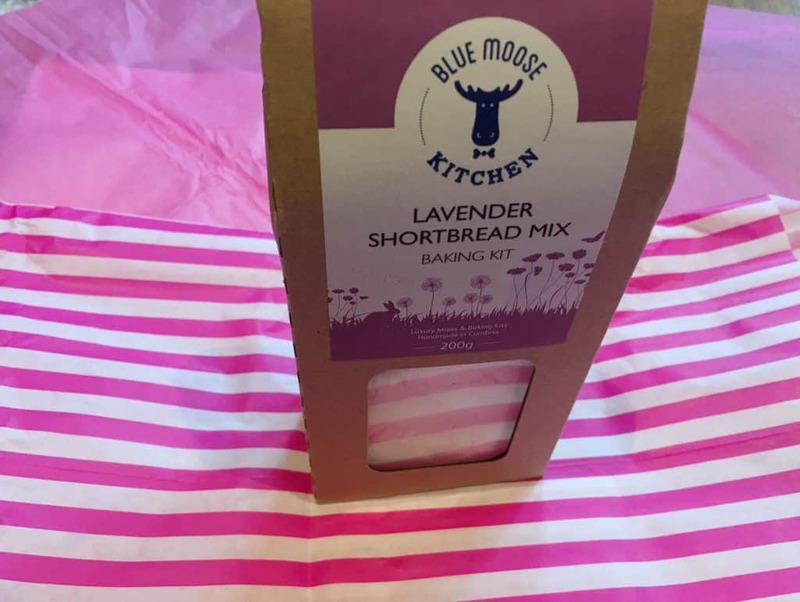 Infused with real lavender leaves, this mix will delight your friends- lavender immediately invokes images of pastoral countryside and plumes of billowing purple flowers- and brings something novel to the traditional biscuit bill. The most appealing part of this mix is that it only requires the addition of butter and very little work on your part. And you can’t be accused of not baking them yourself- you don’t have to disclose that you bypassed the weighing of your ingredients, though. A package of pretty cards never goes amiss- they’re always good to stockpile for any occasion that warrants written correspondence. The package of six notecards was designed for Bright Paper Packages and accompanied with brown envelopes and matching envelope seals. Each card is made from recycled paper and inscribed with a small ‘If in doubt, make tea’ detail in the corner. 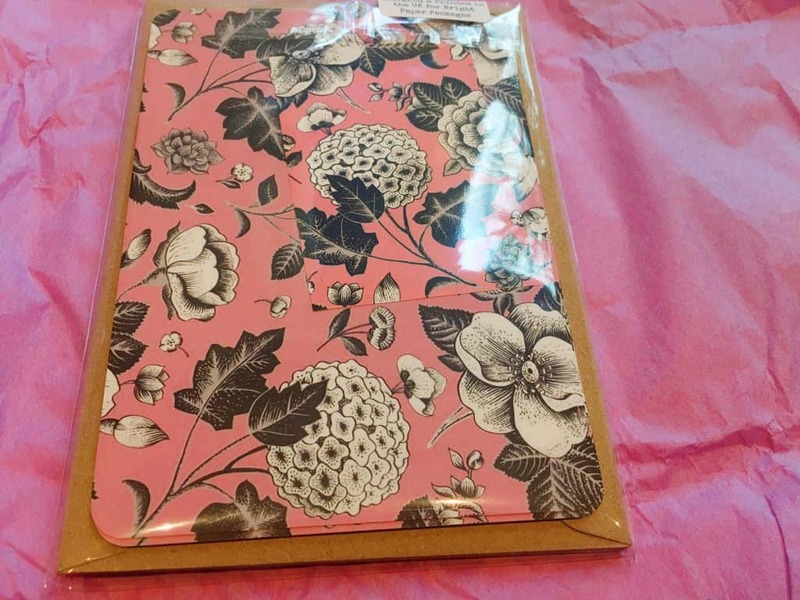 The cards are decorated with a handsome monochrome floral pattern set against a soft pink background. With rounded corners and a universal theme, they can be used in a number of contexts. Tea bags were always going to feature in an afternoon tea themed box, so I was curious to see which ones made the cut. Two tea bags were included from Jenier World of Teas, one a Duchess Earl Grey and the second a Kaika Cherry Sencha. Not your Nan’s customary tea party staples, these two picks are whole leaf pyramid tea bags, which mean the convenience of a tea bag without tea balls or strainers required. 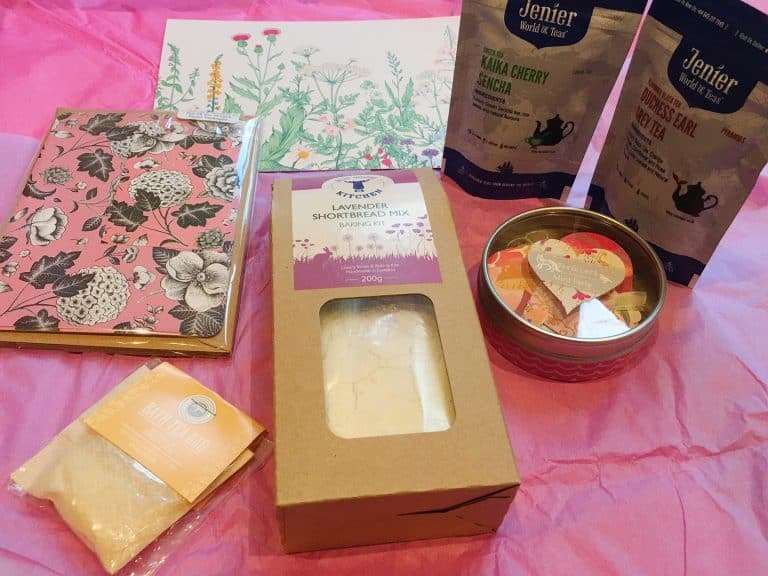 These floral examples were specifically included because the Bright Paper Packages team felt that they would complement the lavender shortbread. A whiff of both varieties indicates that they would be a perfect bright and aromatic afternoon cuppa. Finally, a tea bag of another persuasion has been thrown into the mix- a bath teabag from Wild Olive. This is an idea that is completely novel to me. Like a bath bomb, this little sachet contains Dead Sea salts, natural essential oils and- you guessed it- real tea. This is thrown into the bath for the full body version of the relaxation experienced with a proper cup of tea. 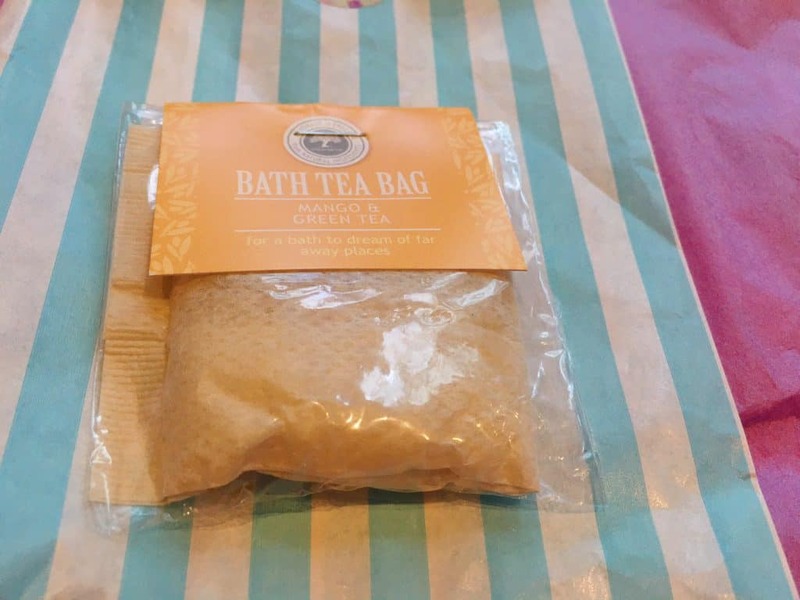 I love the playful idea of a bath tea bag, especially when it is so obviously natural and not packed with lurid colours that require a post-bathing scrub of the tub. The afternoon tea theme is clever because it is conducive to showcasing some fantastic British designers and products- the floral motifs, the shortbreads and tea can be enjoyed across many occasions. I loved the idiosyncratic nature of the products in particular. The easy premixed baking kit is perfect to make quickly when visitors are on their way and the unusual flavours of tea will be an excuse to take a moment out of a busy day. Tea is such an intrinsic part of British culture that the box emanates an old-fashioned charm despite the modern spin on its contents. Bright Paper Packages is available at £20 with shipping included for a one-off purchase (and other subscription options are also available). Filled with a range of high quality, local products and bespoke designs that have been commissioned for the box, this is an excellent way to discover a gamut of new and exciting British wares. 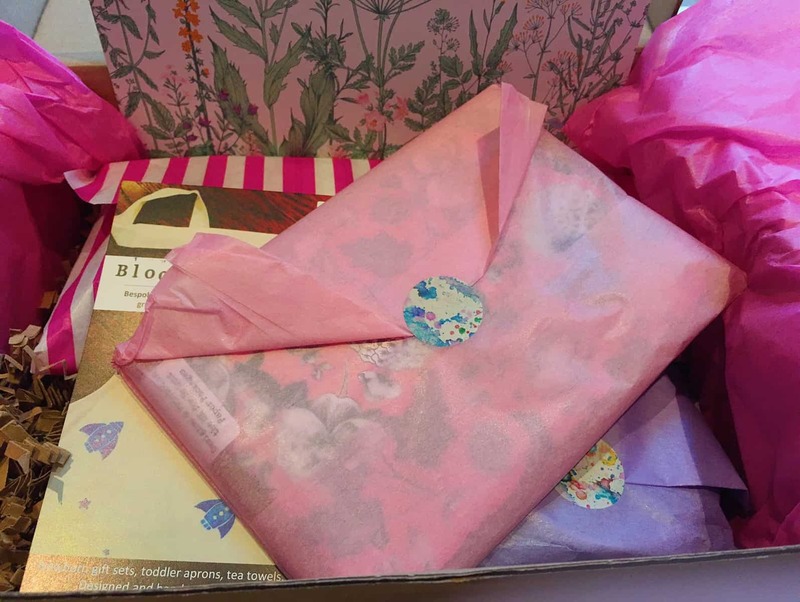 It makes a great gift box for someone who relishes striking designs and deserves an opportunity to pamper themselves. Another bundle of ascetically pleasing, delicious and surprising items, May’s Bright Paper Packages has made the afternoon tea party a contemporary and trendy affair. Hints of vintage balanced with nuances of updated classic, you’ll be looking for an excuse to break open the party in a tin, even if it’s only a cuppa and biscuits for one. What could be better than the very British celebration of tea, design and shortbread? A great selection of vintage and modern treats.